While inside the fiery heart of the sun and in the further reaches of the universe there is an abundance of pure hydrogen, on Earth hydrogen is only found in chemical compounds. Most hydrogen produced today is a by-product or a co-product of processes used in the chemical industry, and is then used again by the industry. On a large industrial scale, most hydrogen is produced through the steam reforming of natural gas, a process which also releases CO2. Alternatively, hydrogen can be produced from water using electricity. 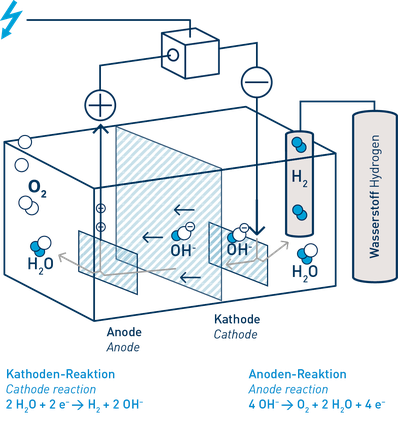 Using a process of electrolysis, water is split into its component parts: hydrogen and oxygen, and the energy used is stored in the hydrogen. If the electricity is generated from renewables, like wind power, the hydrogen is a zero-emission product – what is termed “green hydrogen”. If the electrolyser is used directly at a wind turbine there is yet another benefit: if the wind turbine generates more power than can be absorbed in the electricity grid at any time, this excess power can be used to electrolyse water and stored in the hydrogen. The hydrogen gas can be used as a buffer in the intelligent electricity of the future. Today it is still very expensive to produce hydrogen by electrolysis, because of the small quantities involved, the fact that the electrolysers used are still not series products, and the fact that some of the technologies are still at the research and development stage, but also because the oil price is currently so low. That is why many projects are still using what is known as “grey hydrogen”, which is produced from natural gas, to cover up to 50 per cent of their needs. The goal, however, is always to extend the volume of hydrogen produced using renewable energy.